The Sixth Annual Intown Ten 10K and 5K Road Races are coming up on Sunday March 5, 2017. New this year we have added a USATF certified 5K that will start one hour before the 10K. We like to call it the Intown Ten “Lite”. I started the Intown Ten for similar reasons that I led the 2004 reboot of the Virginia-Highland Tour of Homes. I had enjoyed attending Home Tours, but there was not a tour in VAHI. Similarly, my wife and I enjoyed running 10K’s, but at the time there were none that were local and even the 10Ks we liked had crummy shirts. So, I created the Intown Ten, a local 10K with awesome shirts that people actually wear. A year later we started offering an upgraded thermal shirt. We are the only race that does this. The race starts and finishes near John Howell Park, which allows for families to gather and root-on the runners and maybe shoot some baskets courtesy of the Hawks; enjoy snacks from Whole Foods; or get some shoe advice from running partners Phidippides and Highland Runners. Race proceeds benefit local causes including the YWCA of Greater Atlanta and Trees Atlanta. Six years later, the Intown Ten is still the only 10K that starts and finishes in VAHi. With the addition of the 5K, our goal is to expand the event to not only competitive elite runners, but to people of all ages who are building up to longer distances or are simply looking for a fun, health-oriented event. Despite some of the challenges of the course, many participants use their Intown Ten times when registering for the Peachtree Road Race. 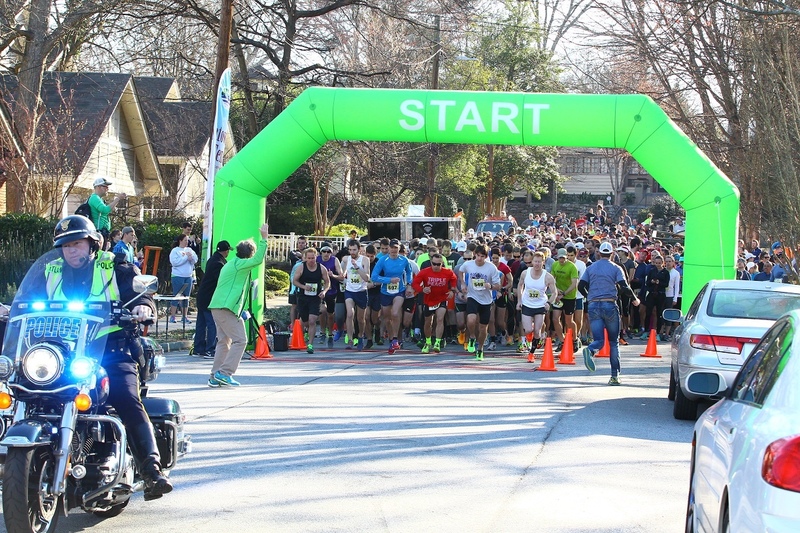 We have a large corps of intown runners who come back year after year, but more striking are the many runners who travel from Suwanee, Buford and beyond, year after year, to attend the race. It might be sunny, it might snow or rain, but come back they do. Reasons we have heard include the beautiful setting of the neighborhood, the great shirts, and just the overall experience of running a more intimate, well-executed 10K with predictably great snacks at the finish and a warm neighborhood feel for those involved. We look forward to the 6th running of the Intown Ten. Regular, well-attended neighborhood events are symbols of a vibrant community. They bring neighbors together, and events such as the Intown Ten mesh with the vision of the neighborhood master plan of Healthy Living. This entry was posted in news and tagged Intown Ten by Stephen Cohen. Bookmark the permalink.